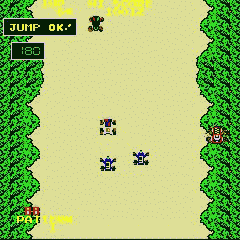 In Burnin' Rubber, you must guide your buggy along the various racecourses, through the four seasons of the year. Each season has a different landscape, littered with different obstacles and different terrain. Your adversaries take the form of other types of cars, which have different abilities. You can destroy the enemy cars by bumping them into the walls of the racetrack, but some cars are harder to bump than others. There are also trucks which appear and drop rocks in your path, which you must avoid. Your buggy does have one special ability that all of the other cars do not; namely the ability to jump high in the air. You can use your jumping power to leap over the enemy cars, crush them by landing on them, and in some instances it is necessary to jump over a stretch of water to continue on your way. 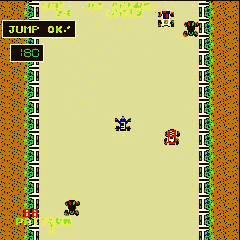 There is a speed guage at the top left of the gameplay area, and just above it is a jump indicator. This tells you whether you currently have enough speed to perform a jump, as you must be travelling over 100 to jump. Your top speed is 220. When your car is jumping up at high speed you are moving faster than the cars on the ground and therefore overtake them. If you jump while moving more slowly, other vehicles will be moving quicker than you and you will land behind them. From time to time you must jump over river crossings which are interspersed with islands, which you can land on to jump again and clear the next stretch of water. Occasionally there is a thin strip of land up the left side of the track which you can drive along to avoid the water. The enemy cars will move from left to right and speed up and slow down, trying to block your path and bump you into the walls. If you block them off when the track narrows they will not reappear until later. This way you can get rid of the harder cars and make your trip slightly easier. When you clear the stage your car is refuelled, and bonus points are awarded for the number of cars you have destroyed. You then move on to the next season. TG settings are to start the game with 3 lives one extra life is awarded at 30,000 points. Scoring Destroying a car: 200 - 500 points. End of stage bonus: 200 + 100 points/level x number of cars destroyed. Special Bonus: 50,000 points for destroying no cars. You can jump off the edge of the screen and land on the other side. Use this tactic to escape from a tight spot, but only when the track is widest. Go for the 50,000 bonus on all stages, as you can't get close to this score destroying cars. Try not to get caught between three cars, as when you bump one into a wall, chances are the impact will bounce you back into the wall.